What do you do with your loquats? Have you ever seen the fruit? If you live in Southern California, you merely need to look out of your kitchen window to know that loquat season is here. Loquat? Yup folks, we live among these small, yellow, egg-shaped fruit. Before last spring, I had never seen one. I guess I wasn’t paying attention because on our block alone, five of our neighbors have trees dripping with the acidic fruit. I recently discovered that we, too, have a tree on the side of the house. I can’t believe how I had never tasted this honey-sweet fruit before now? They are everywhere except the grocery stores. The best way to eat them is to give a quick rinse and pop them in your mouth. You can use loquats as a substitute in any recipe that calls for stone fruit. The flesh is a lot softer though so you will need to adjust the cooking time. Loquats make great jams and compotes. And when you have exhausted your canning jars, you will still have lots of fruit left over. 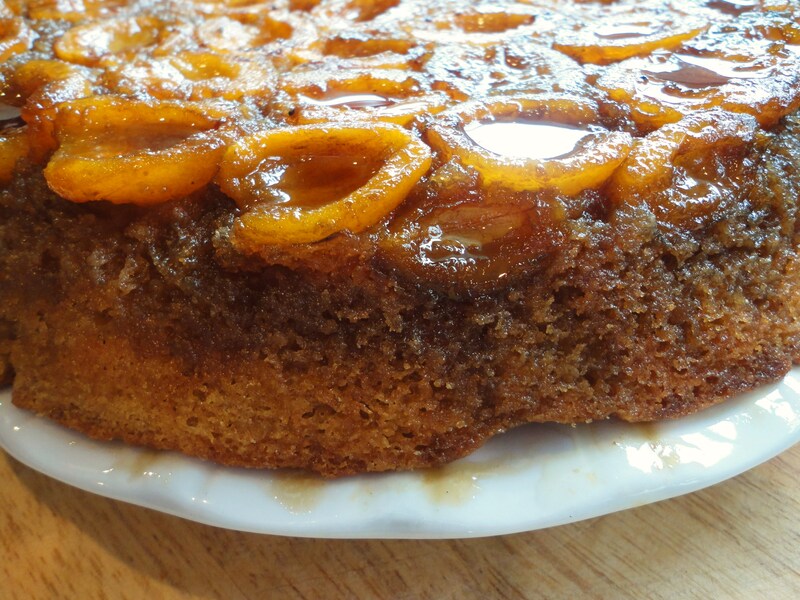 So enjoy this recipe for a loquat upside-down cake. 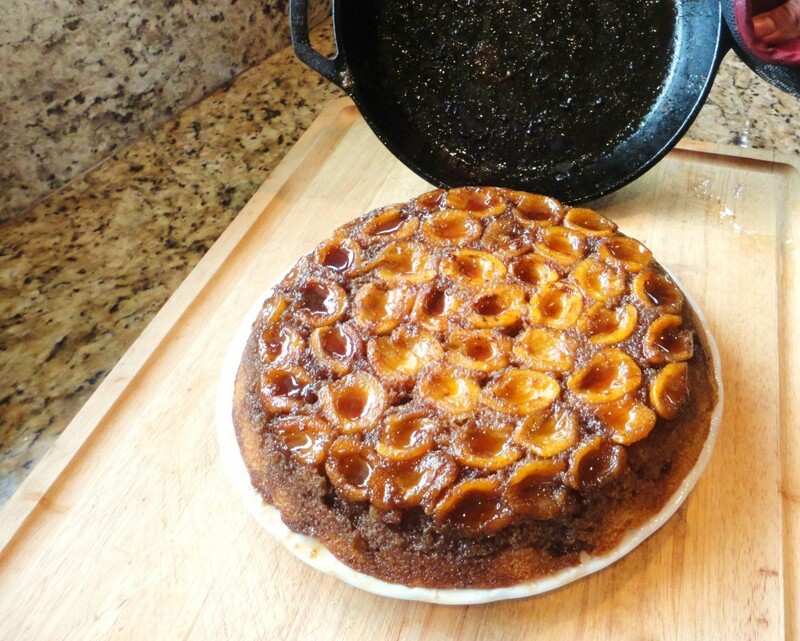 The cake is dense but the the butter and sugar penetrates the cake to make it moist and sweet. The cooked loquats will just melt in your mouth with each bite. The cake is best eaten while it is still warm. In a 10 inch cast iron skillet, melt the butter over medium heat. When the butter is melted, reduce the heat to low and evenly sprinkle the brown sugar in the pan. Cook for about 3 minutes without stirring. Take the skillet off the heat and carefully arrange the loquats in a single layer in the cast iron skillet, cut side down in a circular pattern, starting from the center, working your way to the edge of the skillet. This is hot sugar so please be careful! Let it sit for a few minutes while you put together your batter. Sift all the dry ingredients into a medium bowl. In a separate bowl, cream the butter and sugar with a hand mixer. Beat one egg at a time until fully incorporated. Mix in the vanilla and then the eggs one at a time until fully incorporated. Next add the sifted flour mixture and the buttermilk into the creamed butter and sugar, alternating in about 3 batches. Pour the batter over loquats carefully. Place on the middle rack in your oven. Bake for about 35-40 minutes, or until a toothpick comes out clean. Once it is out of the oven you’ll need to work quickly and carefully: place your cake plate/platter over the skillet and flip it over. Slowly and carefully remove the cast iron skillet. Thank you so much for the recipe, I have a loquat tree in my front yard and never know what to do with all of them when we have a bumper crop – well now I know and WOW was it delicious!! Art says to share a picture and send us some loquats!! LOL! We have a tree, but it’s in the shade and didn’t give us much fruit this year. Our neighbor’s trees are loaded. Glad you enjoyed the cake recipe. It’s good!